Dedee Shattuck Gallery is pleased to present Jamie Young and Bryan McFarlane. This exhibit pairs two established oil painters who explore the identity of place. The exhibit runs July 30th through August 24th, with the artists’ reception on Saturday, August 16 from 5-7pm. Jamie Young lives and works in Ashfield Massachusetts, a Berkshire community known for incubating talented artists. Her studio is in a beautifully refurbished building on her horse farm, but she often loads up her truck bed with her easel and paint to travel through the rolling hills and hay meadows capturing the light and landscape. She is a studio painter by practice, but often sketches and paints studies for her large canvases en plein-air. 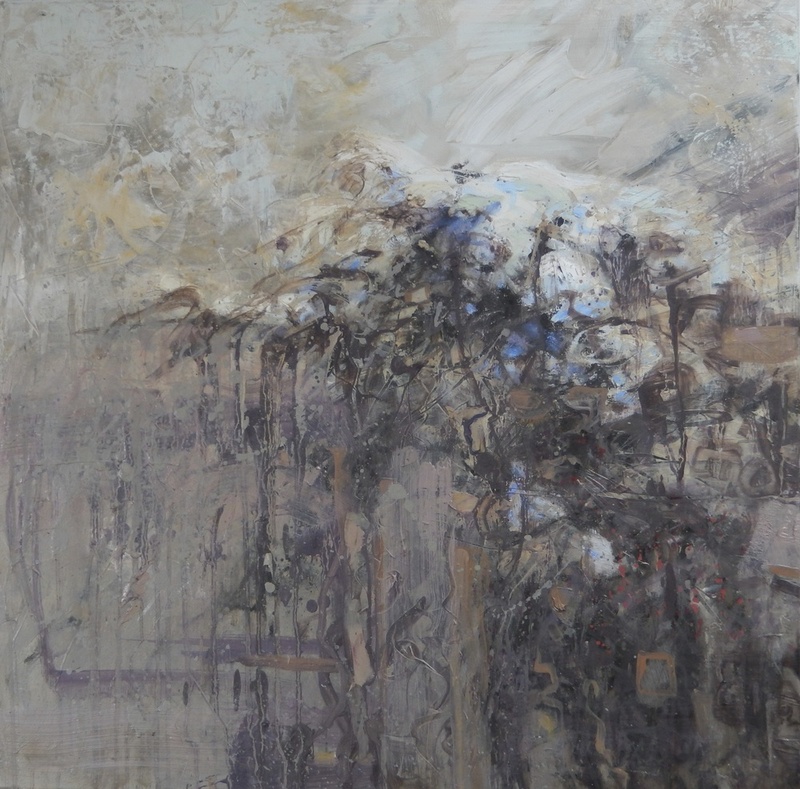 Young seeks to capture the feeling of a place and the quality of light rather than creating a formal representational landscape painting, embedded in her images of flora are observations of climate change. 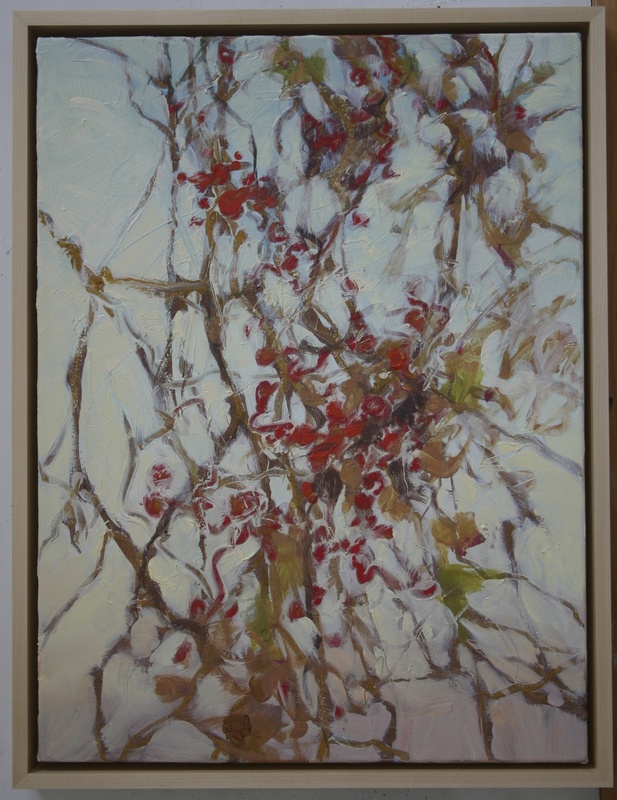 Her works are energized and gestural, representing the passion with which she captures the beauty of her surroundings. She is particularly attracted to wild vines enveloping leafy trees, bows dipping into rippling rivers, and sunlight shimmering on foliage. This exhibit will feature a selection of Ashfield paintings, as well as paintings of our own Westport, Massachusetts. Her unique perspective, warm golden color palette, and energetic painting style will enliven our walls for the month of August. Bryan McFarlane is a Boston painter and a professor at University of Massachusetts Dartmouth. McFarlane splits time painting his large scale, semi abstract, oils between his studio off of Harrison Avenue in Boston, and one in China. McFarlane was born in Jamaica, and has travelled extensively including to his father’s home country of Ghana. Whether he is in Jamaica, Ghana, China, Boston, or Dartmouth Massachusetts, McFarlane is always examining the arts and expressive styles of his surroundings. He then synthesizes them in dynamic compositions that are inspired by these varied creative environments, but also take on themes of identity, climate change, and globalization. His works are abstract, but contain occasional representational elements, depicted in a style that draws from Caribbean, West African and Boston painting techniques. Artists’ reception Saturday, August 16th from 5:00 -7:00 p.m. I have been painting since I was very little. In my teen years I started painting landscapes. The theme remains the same. I just keep trying to make it clearer and simpler. Often the scenes I paint are very small vignettes that I would pass by most days, but caught in a certain light they come alive. It has been said my paintings are like glimpses of landscapes, images of fleeting moments. I love both working in the field and in the studio. I find that they feed each other. I use pencil, pastel, watercolor and oils. Switching from one medium to another keeps each fresh and I am able to discover more, carrying over, technique to technique. The medium I choose depends on the location and conditions. If I can get my truck or boat to the painting site I will work plein-air. I always carry pencil and paper with me and often use the sketches to paint in my studio large oils on canvases that would be too awkward to take into the field. Driving or walking along, what makes me stop and paint is the light, atmosphere, composition and most of all the Stillness. The Stillness of the Earth is something that we all see and have a need to be with. Painting and drawing are ways for me to concentrate on the Stillness and be more aware, centered and energized. My job is to pass it on. While the country of my birth, offers an excellent setting for a sustained examination of my art and Chinese culture, I feel being on the ‘Mainland’ has created powerful inspiration and implications for my work. My work in China thus far has been one of the most productive periods of my creative life. The world is changing drastically as China plays a major role. I continue to study their artistic traditions, their history and participate with ongoing dialogues in their cultural institutions and society. I have gone ahead through this vision and inspiration to set up part of my current studio practice, for the duration, as it’s environment helps to shape concepts that might lead to the creation of new and more fresh and unique work. In anticipation of discussions needed to under gird the type of innovative art making I often visualize. A launching board for my current work to engage in the greater part of East Asia and the expanded contemporary art scene which China is now a major player. Scholars alike are presently witnessing the transformation of global visual art expression as the continents of Africa, South America, the Caribbean – even Jamaica, spew forth waves of new artists towards a journey to East Asia. to inquire about works, please email dedeeshattuckgallery@gmail.com or call 508-636-4177.